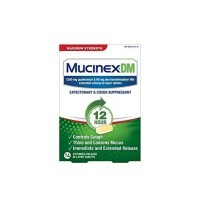 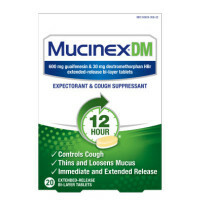 Mucinex DM 12-Hour Expectorant and Cough Suppressant Tablets has a bi-layer tablet with maximum-strength medicines that fights coughs caused by mucus for up to 12 hours. 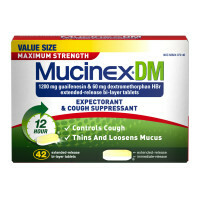 The extended-release bi-layer tablet is designed with two layers. 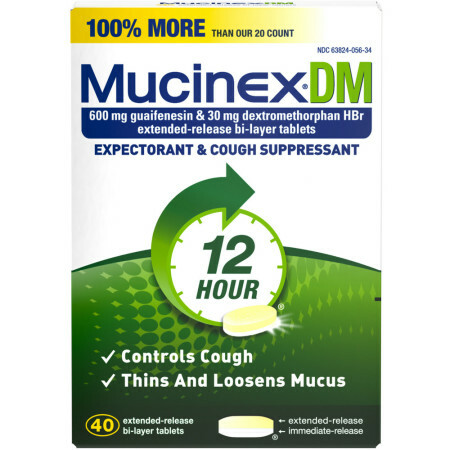 The first layer is absorbed quickly by your body for fast relief. 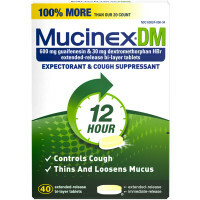 The other layer dissolves slowly to continue relieving your coughs for 12 hours. 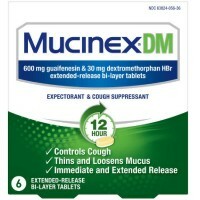 Mucinex DM contains 600mg Guaifenesin & 30 mg dextromethorphan HBr. 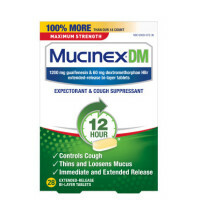 Active Ingredients: In Each Extended-Release Bi-Layer Tablet: Dextromethorphan HBr (30 mg), Guaifenesin (600 mg).